Helpchat, which recently pivoted into a chat-based personal assistant app, is believed to have laid off between 100-150 staffers. "As we evolved, there were 2-3 teams from the earlier model (call centre, quality etc) who we tried hard to scale up and help become relevant within the new reality of the company. We were able to do that for almost half of the people, but that still left some others who couldn't make the cut," Helpchat founder & CEO Ankur Singla said in a blog post. He did not share specific details. Office gossip blog Officechai suggested that over 150 employees of Coraza Technologies Pvt Ltd, which runs Helpchat, were shown the door. Of this, 90 were brand experts, 13 were team leaders and four were assistant managers, the blog said. However, a source in the know said that around 100 staffers of Helpchat were fired. A Bangalore Mirror news report quoted unnamed employees of the company as saying that the inability to raise fresh funding compelled Helpchat to trim its workforce. 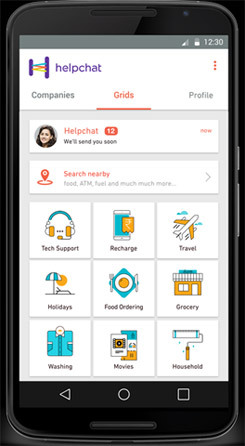 The company recently pivoted to become a chat-based personal assistant app and rebranded itself as Helpchat from Akosha.com, which used to be an online customer feedback platform. It had last raised $16 million (Rs 100 crore) in Series B funding led by existing investor Sequoia Capital five months ago. Back then, had a workforce of around 600 staffers. The company was founded in 2010 by Singla, who was joined by Avinash Vankadaru (in operations) and Vishal Pal Chaudhary (in technology). The erstwhile Akosha provided users information on pricing, discounts, customer service, booking appointments, travel research and so on. Helpchat has also down-scaled the count of employees who could work from home (WFH). "In addition to those let go because of evolving our earlier business, we also downsized our innovative work-from-home program for chat experts. Despite several attempts at bringing accountability among WFH experts, we saw that it was extremely difficult to control their behaviour (attendance, training, response times etc) and therefore control the experience they give to our customers," Singla said. "If it had scaled further, it would have led to a really great model for bringing work to WFH women, but despite a lot of perseverance, the time came to close that experiment," he added. Last month, Helpchat acquired Mumbai-based deals and discovery platform Niffler for an undisclosed amount. In the last few years, the country's booming startup ecosystem has attracted talent from some of the best engineering colleges. While many startups have gone on to create value for investors and employees, some are compelled to either cut costs (through job cuts) or close down completely. Several startups have resorted to mass firing in the recent past as they deal with high cash burn rate, wafer-thin margins and waning investor interest. Last week, Techcircle.in reported that online supermarket LocalBanya.com is shedding 40 per cent of its employee base as the startup is altering its business model. Mobile-only food ordering startup TapCibo Online Solutions Pvt Ltd, which operated under the brand Dazo, closed operations recently. In September, TinyOwl Technology Pvt Ltd, a Mumbai-based startup that offers a location-based mobile app for ordering food, cut over 100 jobs. Recent news reports indicate that Housing.com has shown the door to 600 employees to trim costs.